I've no end of projects on at present, and have none of them even nearly finished, so the last thing I need to do is start another one. So that's just what I did . This one shouldn't take too long, however the layout it will eventually run on (C Rapper & Sons) is well and truly on the back burner. I've justified it as "proof of concept" for future builds . The last picture shows Pete the fitter standing beside it. 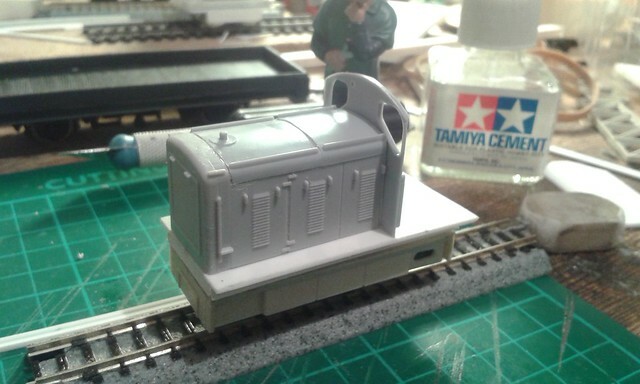 I've wondered for long enough if it would be possible to successfully shorten the Airfix shunter engine cover; it turns out that you can. 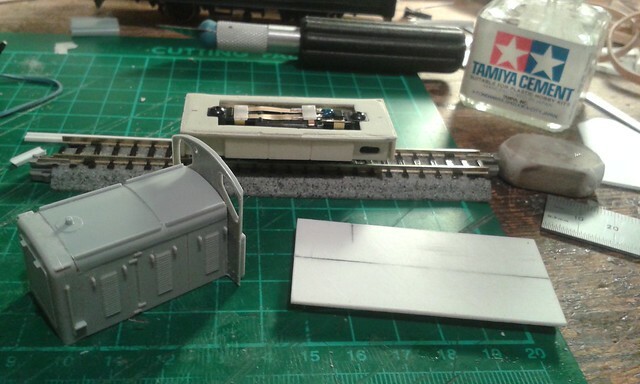 The newer kits (the Dapol ones made from recycled plastic) are quite soft and easy to cut and file with an emery board. For their age, they are still quite detailed mouldings, and when painted and with tools / odds and ends added hopefully will look ok. 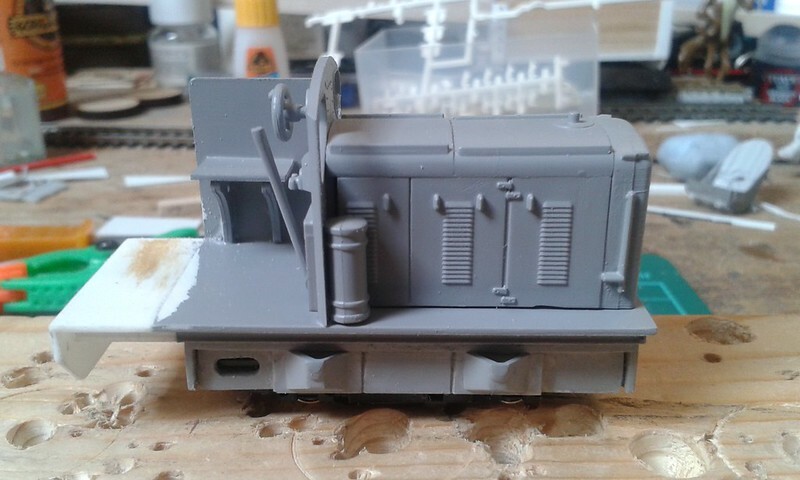 I used the cab front as is, mainly because it was an easy solution, and (I think) looks ok despite the cab windows. 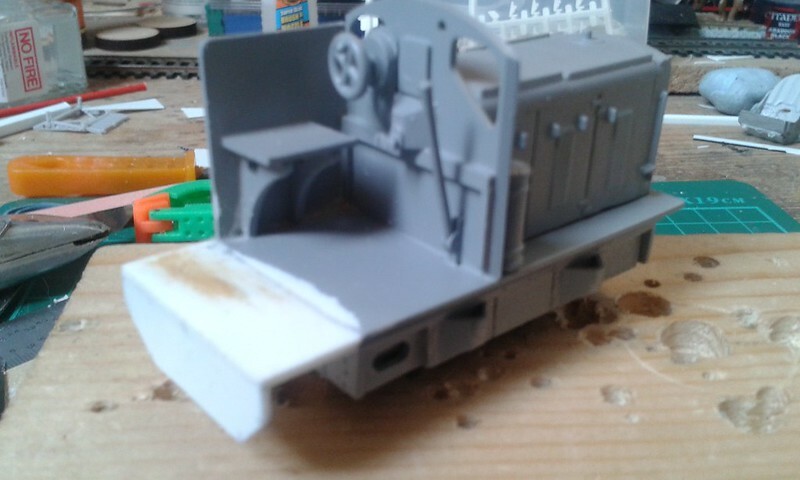 The footplate is a styrene rectangle with styrene "girder" glued underneath to clear the top of the Kato chassis in the Pugbash Permitter. Next is to add the seat, basic controls - brakes, throttle, clutch pedal and gear lever - as well as a cab side (one side only) and a low back. I'll knock these up out of odds and ends from the scrap box. It now has a seat, brake wheel, part of the throttle and a gear lever. The air filter has also been added on the right beside the engine cover. All being well I'll get it primed tomorrow. 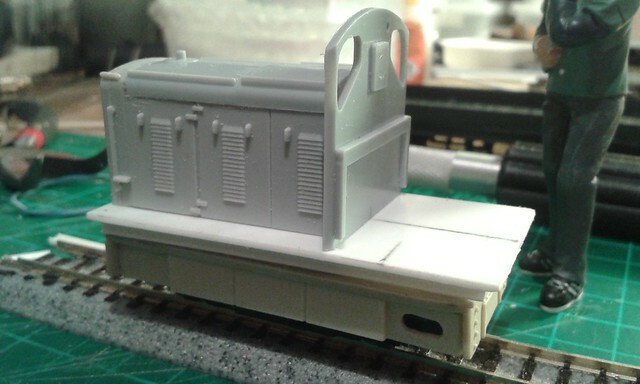 Rather than adding a cab back, I'm going to put a post at the back right of the footplate and add a chain across the back, to give a bit more room for the driver. This idea was nothing to do with me; all credit to Scenic Director Leanne. As you might expect with a Kato 11-103, it runs nice and smoothly. The engine compartment has quite a bit of lead in it, which helps no end. 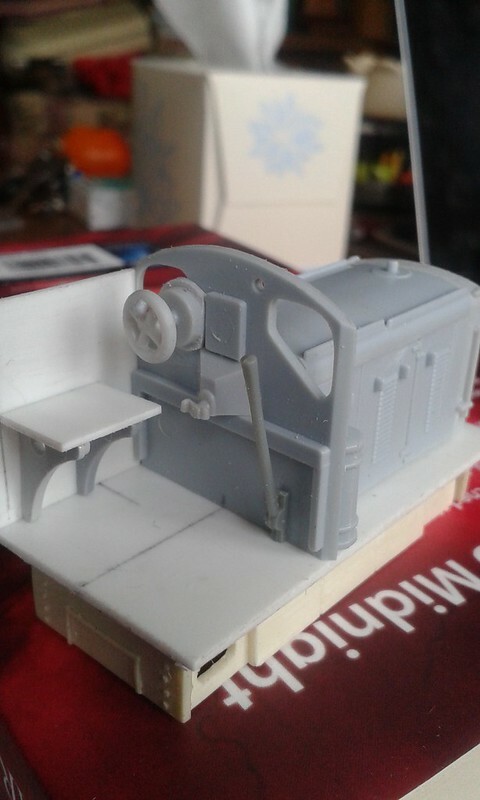 I still need to make the cab back & new seat, and also fit a safety chain along the right hand side. The existing seat will have a couple of spanners, a hammer and an oil can on it when I get to the detailing stage. I've altered the back story for it as well. Instead of being bought new, C Rapper & Sons acquired it cheaply from a closing seaside tourist 7 1/4" gauge line, where it had been driven from an attached driving car. It was sent to Fat Les's U-Boat Works for re-gauging to 8 1/2" gauge, and the footplate extended while it was there.